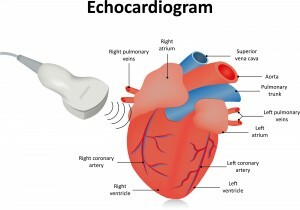 An echocardiogram, often referred to as an “echo,” uses high frequency sound waves to produce images of the heart. This test allows your physician to evaluate the structures of your heart, including the muscle, valves, and pericardium. Take your normal medications on the day of your echocardiogram. Do not use powders, oils, or lotions on your chest or abdomen on the day of your exam. Wear a two-piece outfit (no dresses). A gown will be provided. You will be asked to remove your clothing from the waist up and wear a gown. Three electrodes (small stickers) will be placed on your chest and upper abdomen to monitor your heart’s electrical activity during the exam. The ultrasound transducer (a small, hand-held wand) with gel on the end will be rubbed across your chest in several areas. You will be asked to change positions to assist in obtaining different images of your heart. Most of the test is typically performed as you lay on your left side with your arm resting on the pillow by your head. You may be asked to hold your breath at times during the exam. You should not feel any major discomfort during an echocardiogram. Some slight discomfort is occasionally felt from the pressure of the transducer on your chest. An echocardiogram generally takes from 30-45 minutes to complete. After your test is complete, you may get dressed and return to normal activities immediately. Before you leave, you will be scheduled to receive your results from your physician.